Having already caught up with Coxswain Bob, Deputy Coxswain Anna, Mechanic Dave and Crew Member Steve, this week we learn a little more about Crew Member Jackie. Hello, Jackie. How’s your week going so far? Yes, I’m a general practitioner at the town’s medical centre. I used to work in the emergency department of a busy city hospital, but I realised gradually that I wanted to be able to get to know my patients a little more and to get experience of a broader range of injuries and ailments. And you have children, too? Yes, two girls and a boy. Rachel is twelve, Sarah is nine and little Archie is seven. Though I suppose I shouldn’t call him ‘little’ Archie any more. He really won’t like that. How do you manage to balance your work and home life with the demands of being on the lifeboat crew? Well, my work at the surgery is quite structured, which helps a lot. I see patients on Mondays, Wednesdays and Thursdays, so I’m not available for ‘shouts’ during the daytime on those days, but on Tuesdays and Fridays I’m a lot more flexible and can go out on the boat if my pager goes off. My husband, Ben, is a teacher at the local secondary school and is usually at home during the evening and at weekends, so he holds the fort if we get called out then. I’m exhausted just hearing about it. It’s really not that bad. 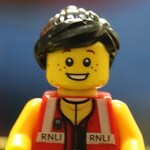 We have our routine and the rest of the lifeboat crew know when I’m available and when I’m not. Like most stations, we have a big calendar showing everyone’s availability, so the Lifeboat Operations Manager or Coxswain can identify any gaps and do something about them. The crew must really value your medical expertise. Well, all members of the crew are given casualty care training, which is really very good and allows them to deal with most of the medical situations they’re likely to face. But yes, sometimes it’s helpful to have a doctor on board. And if they need advice when I’m not there, they can get put through to the surgery so that I or one of my colleagues can help them. What made you join the lifeboat crew? I’ve always been into watersports, from sailing and kayaking to – more recently – open water swimming and stand-up paddleboarding. I know how much pleasure these things can give people, but I also know how dangerous they can be. Sometimes it’s because people don’t understand the risks or because they don’t have the right equipment, but sometimes things just go wrong even if you’ve done everything right. I wanted to be able to help people who get into trouble at sea, regardless of the reason, so joining the lifeboat crew seemed the logical thing to do. For me, it’s the knowledge that I’m giving something back to a community that has given me so much. Whenever we launch the lifeboat, I’m always very aware that it could be one of my patients or one of my husband’s students who is in trouble. And what do your colleagues and patients say when they see you racing off to the boathouse? As a GP, I’m used to getting stopped in the street or when I’m out shopping. But when people see me running down the road towards the harbour they know what’s going on and they know that I need to get there as quickly as possible. On one occasion, a patient who happened to be driving past even gave me a lift in his car. One of the great things about the lifeboat is that it really does seem to belong to the whole town. And the overwhelming support of everyone here really does make a difference. This entry was posted in Interview with the Crew and tagged Crew Member Jackie, Lifeboats, RNLI, The Lifeboat Crew by Simon Perks. Bookmark the permalink.